Engaging foreign citizens’ labor inevitably involves the employer in issuing the required package of approvals, adherence to the terms and procedure of notification of state structures, strict implementation of the immigration legislation rules. Breach of any of the duties of the employer while they are being performed entails substantial administrative penalties and failures in the organization performance. To eliminate these risks we suggest you entrust treating all the matters involving the legalization of foreign citizens’ labour to the “UNION Group” professionals. The price for CIS citizens is from 16 500 rub. per employee. The price for visa citizens is from 29 500 rub. per employee. Bus tour to Chernihiv (Russian–Ukrainian border) is 6 500 rub. per employee. * - In common practice the expenses on documents issuing are fully or partially paid by the employee himself, this allows to reduce cost loading for the organization. Outstaffing implies transfer of particular employees (departments, branches) to external organization but not some specific functions of enterprise. These employees are officially hired by member of “Union Group” organization and actually work at the original place and perform the same functions whereas all employer’s liabilities against them are performed by "Union Group". Outstaffing allows your organization to be relieved of responsibility for compliance with the labor, immigration and tax legislation against outstaffed employees. The price of service package is from 900 rub. per employee a month. * - The price depends on the list of services in outstaffing package and on the number of employees. According to clause 3 of “The Regulations on furnishing of guarantees on financial, medical and housing provision of foreign citizens and stateless citizens during their period of stay in the Russian Federation", approved by the RF Government Decree № 167 dd 24.03.2003, the host party (i.e . employer) shall provide a foreign citizen during his stay in the Russian Federation with medical insurance policy, issued in accordance with the established procedure. 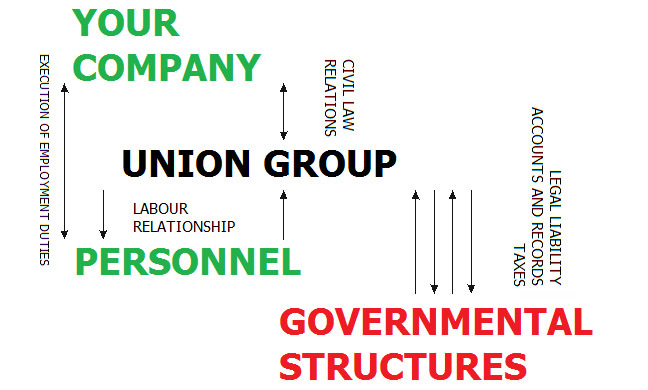 To implement these requirements of the Government Decree as well as to provide working foreign citizens with proper health service, the "Union Group" together with the "Guideh" insurance company have developed a set of insurance programs, which altogether provide for all the needs for the insurance medical service of a foreign citizen working in Russia. Non-recurrent emergency medical aid (insurance coverage 80,000 rub, 3 months): 250 rub. Ambulatory medical aid (insurance coverage 4,500 rub, 3 months): 750 rub. It is a well-known fact that the state's requirements to employer are varied, they are constantly changed and activities of many public authorities are aimed to control their execution. The employers which engage foreign citizens in their performance are no exception. The first to control such employer is the Federal Migration Service and the responsibility of the organization, in case of non-compliance with the laws may be estimated up to millions of rubles and lead to the suspension of the organization activities for a period up to 90 days. The "Union Group" with a staff of employees, who spent many years in the field of immigration control at the Federal Migration Service, proposes to hold an on-site audit of the current situation connected with the involvement of foreign nationals in your organization. An inspection has the scenario of the FMS, but is significantly increased and lasts from 2 to 7 days. During the audit all the documents for foreign citizens and the host organization and premises, including production, storage facilities and living quarters, are examined, the process of engagement, hiring procedure and accommodation of workers are examined. The audit results in a full list of violations, explanations of possible penalties on the part of the state and recommendations to remedy the violations. The price of the audit is 20 000 rub. for organization with up to 50 members of the staff. If the staff is over 50 people, we charge extra 15 000 rub. for each 50 persons. * - The audit is effected free of charge in case an agreement to eliminate detected violations has been made. 39d Radisheva str., St. Petersburg, Russia.